Map of the Aegean Sea. Thracian Sea is shown in its top. The Thracian Sea (Greek: Θρακικό Πέλαγος, Thrakiko Pelagos; Turkish: Trakya Denizi) is a sea that is part of the Aegean Sea and forms the northernmost point of the sea. Regions surrounding the sea are Macedonia and Thrace as well as northwestern Turkey. The entire stretch of the sea lies north of the 40th parallel. The length from east to west is from 23°E to about 25.8°E or from the Strymonian Gulf east to the northernmost part of the Gallipoli peninsula and the width from north to south is about 40.25°N to 41°N or from the Dardanelles north to the boundary between the Xanthi and the Rhodope regional units. 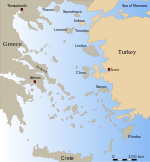 Islands includes Thasos and Samothrace in Greece and Gökçeada (Imvros in Greek) and Bozcaada (Tenedos in Greek) in Turkey. The bays and gulfs includes the Ierissian Gulf to the southwest, the Strymonian Gulf where the Strymon River empties, the Kavala Gulf and the Saros Gulf in Turkey. Rivers emptying into this portion of the gulf include the Nestos and the Evros/Meriç. The famous thermal springs are Loutra Eleftheron in Kavala.